This moist & tender chicken is reminiscent of fried chicken, but without the frying! You’ll save a ton of calories in this baked version. I’ve been making this recipe for our family for years and it always gets rave reviews (except when I forget to keep an eye on it and overcook it, so it is dry!) Just make sure to check it for doneness (internal temp of 165°) so it doesn’t end up dry. You can also use chicken thighs, if you prefer. Just make sure you remove the skin from whatever cut of chicken you prefer. To make this gluten-free, you just have to make sure to use gluten-free bread crumbs. You can buy ready-made gluten-free bread crumbs at the store, or you can make your own. Making your own is a great way to use up all the old heels/ends of the gluten-free loaves of bread that you buy or make. You can just throw them in the freezer until you want to make your own breadcrumbs. For store-bought crumbs, I really like these gluten-free corn flake crumbs. Corn flakes are usually a no-no on the gluten-free diet because they have malt in them. These do not have malt or any other gluten and are safe for our gluten-free diet. What I really like about using the corn flake crumbs is that they don’t get soggy like bread crumbs do. I believe that in the photo above I used a mix of bread crumbs and some corn flake crumbs, since I just had a little of each on hand. I’ve made it with all bread crumbs or all corn flake crumbs as well. Working from the pan of chicken in bottom left, I go clockwise: coat the chicken in the flour mixture, then in the egg mixture, and finally coat it well with the bread crumb mixture and place in the foil-lined, greased baking pan. This time I used some super jumbo chicken breasts, but I usually use ones that are a little more normal sized. If you have huge ones, you might like to cut them in half so that you get a little more breading and it looks a little nicer to serve a smaller one, than a cooked large one that you cut in half. 🙂 I learned that the hard way this time! I served this with our favorite Parmesan asparagus. I’ll post that recipe soon as well! Enjoy adding this dinner to your meal rotation. I think you’ll love it! This moist & tender chicken is reminiscent of fried chicken, but without the frying! In a pie plate or shallow bowl, combine the flour, salt, paprika, and pepper. In another bowl, beat the eggs and milk. In another pie plate or shallow bowl or pan, combine the Parmesan cheese and the corn flake crumbs or bread crumbs. Coast the chicken pieces with the flour mixture, then dip in the egg mixture, then roll in the cheese/crumb mixture. Place in a well-greased, foil lined baking pan. I usually use a jelly roll pan (about 15"x10"x1"). 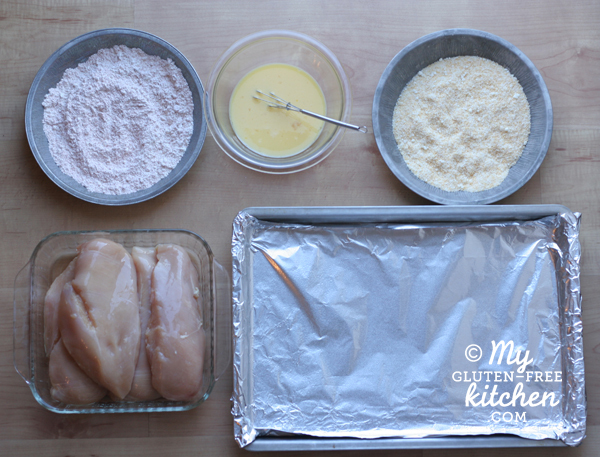 Bake at 400° for 50-55 minutes or until chicken tests done with a thermometer (165°). Can you sub almond flour in place of the gluten-free all-purpose flour? 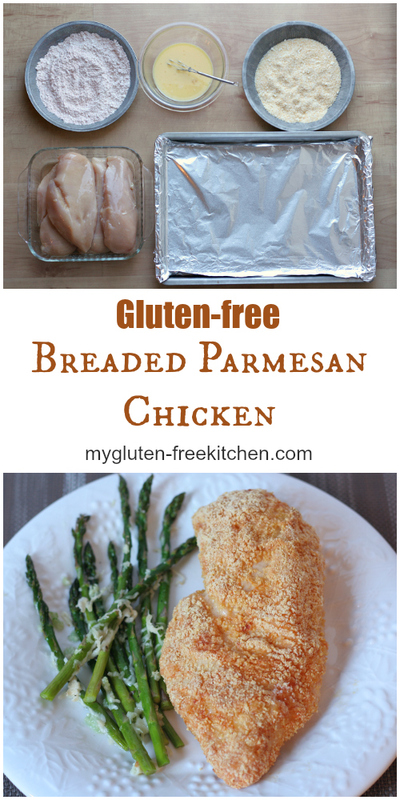 great question Katherine.. What’s the point of using GF bread crumbs if you’re using AP flour? Delicious. Modified for low salt diet. No added salt and the grated Parmesan was enough sodium for us. Also did not have GF flour on hand and skipped that step. Shook pepper and smoked paprika over chicken pieces. Followed the rest of directions. Beautiful crust, moist and tasty. Thank you for the recipe.